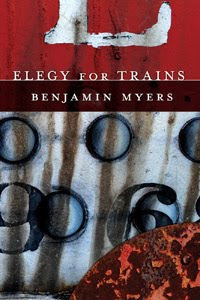 Dr. Benjamin Myers, associate professor of English at Oklahoma Baptist University, recently published a volume of poetry titled "Elegy for Trains," through Village Books Press. "The motivation came when I was approached by the publisher after I read at a local poetry reading," Myers said. "Given the opportunity to publish a collection, I wanted to bring together poems on the theme of loss and redemption, a theme I began exploring in poetry after the death of my father 11 years ago." The book has been praised by, among others, Jim Barnes, who is the current Poet Laureate of Oklahoma and the former editor of the Chariton Review. "Ben Myers takes us over the hills, through the skies and fields, and down to the bottom of Oklahoma's lakes - from space shuttles to noodling for catfish," said Nathan Brown, poet and winner of the Oklahoma Book Award. "He makes us ghosts in its graveyards and guests among the buffalo grass. And among it all, we can hear the coyotes, frogs and blue herons." Myers earned his bachelor's degree from University of the Ozarks, and his master's degree and Ph.D. in English literature from Washington University in St. Louis. He has taught at OBU for the last six years. His poems have appeared in numerous literary journals, including Ruminate, The Mid-America Poetry Review, Möbius, and Byline. His poem "A Small Town Mourns its First Casualty" was included in the illustrated anthology for children, "America at War," edited by Lee Bennett Hopkins and published by McElderry Books (NY, 2008). Myers won the 1996 Byline Literary Award for Poetry for his poem, "For Jack Kerouac." He has studied in select poetry workshops under B.H. Fairchild, Ellen Kort, Michael Harper and Yusef Komunyakka. His essays on poetry have appeared in several highly prestigious academic journals, including English Literary History, Studies in Philology, English Literary Renaissance and The South-Central Review. He has made presentations on poetry at conferences ranging from the South West Conference on Christianity and Literature at Houston Baptist University to the Ninth International Symposium on John Milton at University College of London. Myers lives with his wife, Mandy, and their three children in Chandler, Okla. "Elegy for Trains" currently is available in paperback for $15 through the publisher at villagebookspress@yahoo.com. It will be available through Amazon.com in the near future. Dr. Alan Bandy, OBU Rowena R. Strickland assistant professor of New Testament, recently published the book, "The Prophetic Lawsuit in the Book of Revelation," through Sheffield Phoenix Pres. The book reveals the language, metaphors and storyline of the Book of Revelation which evoke a cosmic law court setting. Bandy said the book is a revision of his dissertation on the book of Revelation which started from a seminar paper he wrote on the "witness" terminology in John's Apocalypse. "What I discovered was that the language of ‘witness' is drawn from the forensic setting in the same sense where we refer to a ‘witness' in a law court," Bandy said. "The more I investigated the legal terminology in Revelation, the more I realized that it is a consistent feature that runs throughout the book. Many articles and commentaries allude to this feature, but no one has argued that it is a motif." 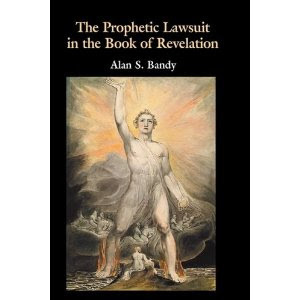 Bandy said his research prompted him to write his dissertation tracing the "lawsuit" motif of Revelation -- a motif which is not unique to Revelation but is common in Old Testament prophetic literature. "I argue that John is writing to believers who may face the legal threat of persecution by being denounced in a law court," Bandy said. "He writes to encourage them to remain faithful to Christ even if it means death, because God will ultimately reverse the unjust judgments of the earthly courts when he holds the nations on trial and judges them. John's vision is framed as a cosmic lawsuit that results in the just verdict of judgment against the wicked and the saints are vindicated." In the book, juridical metaphors of a legal contest between the faithful witnesses and the "accuser of the brethren" are intertwined with images of holy war. "The Prophetic Lawsuit in the Book of Revelation" is the first full-length study drawing together the diverse evidence and reading the book through the lens of the controlling metaphor of the lawsuit. Bandy earned his bachelor's degree from Clear Creek Baptist Bible College, his master's degree from Mid-America Baptist Theological Seminary and his doctorate from Southeastern Baptist Theological Seminary. He joined OBU's School of Christian Service faculty in the fall of 2009. Before arriving at OBU, he served as assistant director of Ph.D. studies for Southeastern Baptist Theological Seminary and as an adjunct professor of biblical and theological studies in Liberty University's Distance Learning Program. He also served as assistant professor of Christian Studies at Louisiana College. Bandy has served in several ministerial church positions including pastor of Teachey Baptist Church in Teachy, N.C., pastor to students at National Avenue Baptist Church in Memphis, Tenn., and pastor to children/youth at Calvary Baptist in Loyall, Ky.